A great mobilization in Brasilia this Wednesday (March 7) will call on President Dilma Rousseff to veto the draft Forest Law Reform bill now before the Brazilian National Congress completely. The mobilization is being organized by over 200 entities that make up the Comitê Brasil in Defense of the Forests and Sustainable Development. 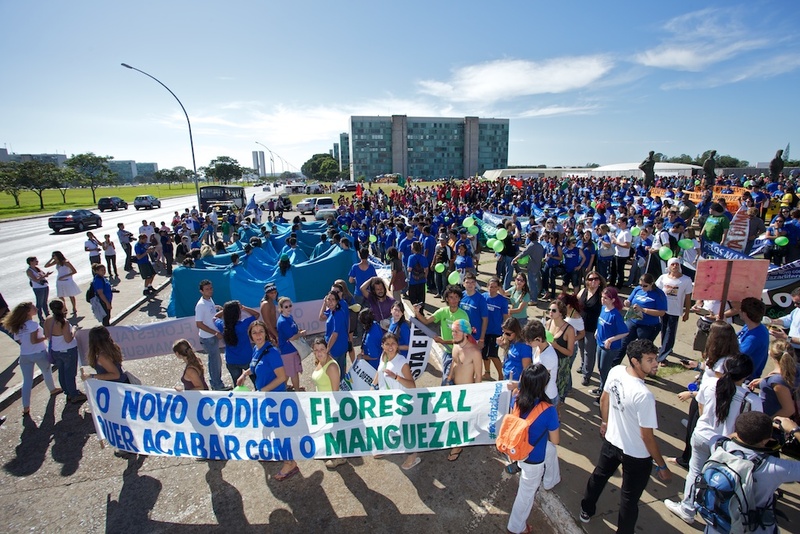 WWF-Brasil is part of the Comitê alongside Greenpeace, SOS Atlantic Forest, The Socio-environmental Institute (ISA), the Brazilian Bar Association, Via Campesina (rural workers), the National Conference of Brazilian Bishops (CNBB) and other organizations. The Comitê Brasil and the Pro-environment Parliamentary Block consider that neither the version of the bill approved by the House of Representatives nor the modified version approved by the Senate which has now returned to the House for a final vote, serve the interests of Brazilian society. At this stage of the bill’s progress, the Representatives have three options: they can approve the text proffered by the current rapporteur, Representative for Minas Gerais, Paulo Piau (PMDB), which he has not presented yet; or approve the Senate text as it stands; or vote again on the version the House approved the first time. “None of the versions serves Brazil’s interests. They are all extremely damaging to the country. Society at large has clearly demonstrated, on various occasions, that it does not accept this reform bill. By approving any one of the versions, the Congress will be turning its back on society which is alert and demonstrating its position in street actions and in the social media”, declared WWF-Brasil CEO Maria Cecília Wey de Brito. “We have to be extremely vigilant to ensure that the interests of small hegemonic groups do not prevail against the wishes of society at large, which is tired of laws that benefit the few to the detriment of the many”, she added. The mobilization this Wednesday (March 7) in Brasilia will start at 8 am in front of the cathedral. From there the demonstrators will march to the National Congress buildings where they will line up to form a human banner displaying the message ‘Veta Dilma’ (Veto it Dilma!). At 11 am the demonstrators will take part in a meeting with the House of Representatives Standing Committee for the Environment and then divide into groups to pressure the parliamentarians of their own states. Voting on the Forest Law reform Bill should have taken place this Tuesday (March 6) but it was postponed until next week at the request of the government’s political support block in the House. According to the leader for the Government in the House Representative for São Paulo Candido Vacarezza (PT), there is still no consensus on some points of the text. Representative for Maranhao Sarney Filho (PV) declares, “there is a very strong tendency” on the part of the Pro-environment Parliamentary Block not to participate in next week’s voting. The decision has not been made as yet but their position should be defined sometime next week.